We’ve finally made it into the final week of the 2018 ETS season! 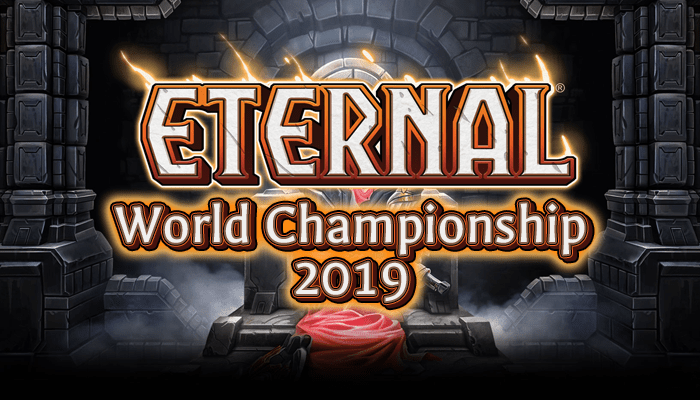 All sixteen Worlds players are finally chosen, and they’re preparing for the final showdown that starts at 11am EST on Saturday, December 8th. While we’re not quite ready to dive into their decks just yet, thirteen of the Worlds players have shared their brief thoughts on many of the Defiance cards spoiled so far. Players are listed in alphabetical order and their responses are reproduced as written. If you want to know what Worlds is or who some of these players are, check out this link. Almost: 4/5 – This card is very efficient fast removal, and being able to stun expensive units means that it is almost never a dead card when compared to suffocate and vanquish which either have a target or don’t..
child roland: Looks good for control, probably better options for aggro/ midrange. Worth trying in midrange probably. lv13david: As the card pool grows, so do units’ stat-lines. This card is going to deliver great tempo and value, but it has some subtle drawbacks. I rate it 4 bear claws. Paradox: This is tough—probably a 2.5 or 3? It gives Justice fast speed removal (which it has little) and answers based on “cost matters”, which tends to be strong. ThePlatypusKing: 1/1 Most versatile 1-cost Justice kill spell. Tobboo: 4 – Gives Justice a very needed form of early defence. Cant really be used in aggressive decks though. Almost: 1/5 – Too expensive. Hard to imagine this seeing play over cards like Desert Marshall and Passage of Aeons. child roland: Too slow and weak body. Very powerful in draft though. lv13david: A 2/3 needs serious upside, which this guy has, but the cost is just too high. I’m not buying it. I rate it 2.5 spirit fingers. Paradox: 2.5 if not higher. 2/3 is a fine body. Demands an answer or can take over the game vs. a lot of decks. It’s obviously slow but it’s both versatile and repeatable and Eternal players have a tendency to underrate both. ThePlatypusKing: 1/1 Most repeatable Pay 4 to activate silence effect ever. TinMan: 4 – Repeatable silence, and a reasonable body. A body that is infected with the power of DANCE!!! Tobboo: Constructed 2 – Draft 4. Doesnt fit the constructed meta at this point. Almost: 3/5 – A solid 2-drop for an aggressive deck that is otherwise weak to torch and hailstorm, like Hooru flyers. child roland: This looks very good. Unseen Tribal has been close to being a thing for a while, possible this pushes it over the line. lv13david: A 2/3 needs serious upside, and protecting your aggro deck from Hailstorm is just that. Unfortunately, I’m not sure that deck currently exists. I rate it 3 cozy scarves. Paradox: 1.5? Maybe? It just doesn’t seem like it does a lot that matters. It’s very reactive and doesn’t really enable game plans or shut down opposing ones in the way Bazaar Trickster does, if we’re comparing 2/3’s. ThePlatypusKing: 1/1 Best Hate Bear of Defiance. Moonshield Protector would’ve been a better name. TinMan: 4.5 – Huge buff in Hooru based aggro, keeping itself and your Unseen Commandos alive vs the most popular hosers Torch and Hailstorm. Tobboo: 3 – Only because it survives torch! Almost: 3/5 – Excellent pun, ok card. Rewarding a go-wide strategy is a bit out of place in Rakano, but it will get to +4/4 before too long. child roland: Funny joke, draft only card I think. lv13david: I appreciate the humor. I rate it 1.5 Udyrs. Paradox: Constructed: 1.0, though probably fine for budget decks. DRAFT: Probably 2.5? Can’t tell w/o the rest of the cards but looks like it can get out of hand. ThePlatypusKing: 1/1 Best weapon imitation of Strength of Many ever. TinMan: 1 – Most weapons are played as a top of the curve in aggressive decks, this obviously can’t be. If it was in Praxis to put into a token deck, I might be more interested. Tobboo: 3 – I could see this going into some kind of rakano token list for sure. Almost: 2/5 – Too expensive for most decks, but pledge helps with consistency and the summon ability is good. child roland: For 8 I want a bit more than a 2 for 1, I think. Could be decent in a control deck, but there are better options for limited slots there. lv13david: If you tilt your head and squint, it almost resembles an unnerfed Channel the Tempest, except you get a 6/12 tub of vanilla instead of 3 power. I rate it 4 heroic poses. Magikarp: On turn 1 it’s a 5 stars out of 5. Any other turn it’s a 1/5. Fun card though! Paradox: 2.0. The summon and Pledge are great, but it costs 8 and that’s a lot in almost any meta. I could be underrating her, though. TinMan: 3 – Dies to Vanquish, but not before getting some value. The versatility of pledge seems like this could be playable, but seems worse than other top end cards. Tobboo: 3 – 8 drops needs to do something the turn they are played, and Eilyn surely does. Im not convinced she does enough though. Almost: 4/5 – All of the modes are good and the flexibility of them makes this a very good card. child roland: Probably flexible enough to be played if FTP is good otherwise. Doesn’t quite draw me to that deck though. lv13david: Traditionally, one of the oddest faction combos, but it’s hard to argue with the versatility here. The most overlooked aspect of this card might be the health gain from mode 2. I rate it 4 explorer waifus. Paradox: 4.0. One of the strongest cards in the game. If your instinct is to play this card, then the main thing you will end up displaying is your high win percentage. ThePlatypusKing: 1/1 Best Display Ever. TinMan: 4 – Seems like an auto-include in any future FTP Moment of Creation decks. Whether those decks are any good remains to be seen. Tobboo: 5 – I see decks being constructed around this card. Almost: 5/5 – This card is busted, and I’ll put 4 Kerendon Merchants and 4 copies of this in every deck until they nerf it. child roland: Probably not, but I wouldn’t be surprised. lv13david: I expect a lot of tears, but I really hope to see the re-emergence of aggro and “Infect”-style decks. I don’t think this card is going to do either of those things without more help. I rate it 3 discolored shawls. Paradox: 2.5. This actually seems like a pretty decent option for shadow-based aggro decks and scream decks. ThePlatypusKing: 1/1 Best Cover of Darkness Reprint Ever. TinMan: 2 – Seems strong in limited, but doesn’t solve any of the problems that shadow based aggro has, namely, everything dies to Hailstorm. They already have Madness, Combust, and Hideout Pistol to remove blockers. Almost: 4/5 – The statline and abilities are great in an aggressive time deck, and Pledge increases the chance that you have a good opening hand. I suspect there will be a praxis list that plays this. BruisedByGod: 4 is the difference between this guy’s hp and titan’s hp but probably 3/5 just because no current deck would want him, time struggles with harsh rule so if they have enough charges maybe they can build differently. child roland: Time 4 drop is competitive slot. This falls just short I think, but does have a lot going on, so maybe. lv13david: Sure, you can Pledge him, but why would you ever want to? He is pretty good if all you want to do is brute-force 5 damage. I rate it 3.5 pocket sands. Paradox: 3.5. This card is very aggressive in all the right ways. Also, I’m really glad to see Time get new angles and also fully embrace Charge instead of being confused knowing Accelerate exists. ThePlatypusKing: 1/1 Third Best Time Charge Unit in Defiance. TinMan: 3 – Fails the Sandstorm Titan test, which is “Is this 4 drop time unit Sandstorm Titan?” No, it isn’t, but I tried to make Venom Rider work in an aggressive deck for far too long, and I look forward to repeating that futility with this guy. Tobboo: 4 – This could easily turn out to be a 1 or 5 though, but I think it has great potential. Almost: 3/5 – I can see this seeing play in a control deck as repeated-chump blockers and a way to push damage once the board is clear. It also makes enemy relic weapons a lot worse. A lot of decks probably don’t want this though, and it does nothing if your golem is permafrosted. child roland: Decent chance I think, goes in sacrifice style decks and works well with weapons/ pumps. One of those strategies will probably get there. lv13david: Not impressed. I can’t see this being playable. Now watch me be wrong. I rate it 1 Steel Golem. Paradox: 1.5???????? It just seems way too slow without a high enough payoff since you’re limited to only 1 golem at a time. ThePlatypusKing: 0/1 Most surprising card that will kill me in the future. TinMan: 1 – Just no, don’t get baited by Double Damage, relics that can make 1/1s are not constructed playable. Tobboo: 2 – Compare it to cookbook and youll see why its low. Almost: 5/5 – Very efficient aggressive unit, and in a deck that plays extra power cards this can easily attack for 7 with overwhelm. Even if you don’t have any power, it’s sort of fine as a 3/1. child roland: Dies a bit too hard to Vara’s Favor for my tastes. lv13david: This card is great and also infuriating. You don’t need me to tell you that. I rate it 4.5 Genetrixes. Paradox: 2.5. Squishy on your turn, but hits like a truck. I think this might be better than Awakened Student in some aggressively-based Combrei aggro decks, which says a lot. TinMan: 3 – Seems strong in an aggressive deck, but is it better than Teacher? Against opposing aggro or midrange, it is very possible, I am willing to try this guy out. Tobboo: 3 – Decent aggro unit that demands a quick response. Almost: 3/5 – Pledge on a multifaction unit is great and this does some interesting things. If you make it unblockable with Secret Passage and copy it with Mirror Image, you can play an unblockable pledge every turn, but the opponent can still develop their board while you do this. child roland: This has enough going on to be pretty decent I think. Just the opening hand fixing alone is respectable. lv13david: The Pledge interaction could be the edge it needs to be viable. Everything else is fairly unimpressive, potential Haunting Scream shenanigans notwithstanding. I rate it 3 red glowing eyeballs. Paradox: 3.0. Hard to know exactly what the deck that uses this will look like, but it’s hard to imagine this card doesn’t half-way make a deck by itself. ThePlatypusKing: 1/1 Most Dreadful Scream Target to Date. TinMan: 1 – If your opponent has any blocker, they can block and trade with it, removing it’s recursion. It seems to me like a 4 cost Dark Return, but worse. Tobboo: 3 – Interesting to see if this gets abused with revenge. Almost: 4/5 – Three very efficient modes at fast speed. The ramp option can play any power card undepleted, which means that you play undepleted seats or banners and still have power leftover for something else. child roland: I think this is flexible enough to get there, but not certain. Will probably depend on how strong the Plague choice is in the format, I think. lv13david: Fast Spell means a lot here. You’ll need to take advantage of that aspect if you want to get your power’s worth out of it. For this to be worthwhile, you’ll want to be able to make good use of mode 2. I rate it 3.5 fancy hats. Paradox: 2.0. It’s not nearly as strong as Instinct but being fast speed and having all these options seems decent. Just make sure it’s in a deck that can use Secret Pages. ThePlatypusKing: 1/1 Maybe play this in a Mask Ramp deck? TinMan: 2 – None of these effects are particularly powerful, in contrast with the FTP charm. Tobboo: 4 – I like choices! Almost: 4/5 – A good finisher for an FTP deck, though it has to compete with things like Heart of the Vault, and 7-cost is a lot. BruisedByGod: what are ruin stalkers? child roland: Probably not, since it dies a bit too hard to Permafrost/ Feeding Time. Maybe if those effects see less play? lv13david: What does a Ruin Stalker do? Assuming they are vanilla, this guy is a pretty straightforward finisher. I rate it 4 wurm tokens. Paradox: 2.0. Seems good vs. Harsh Rule decks and pretty average vs. most everything else. Could be a great market card. ThePlatypusKing: 1/1 Can’t wait to brew 5F Charge Rod with this card. TinMan: 4 – Much like the FTP charm, this seems strong in its deck, but whether that deck is any good in general remains to be seen. Tobboo: 4 – This will lead to such greedy deck! Future predicted! Almost: 3/5 – This card does interesting things when you have a Horde Plunderer in play, but I suspect it will generally die before you have time to play many weapons. It can survive a torch if you play it and leave up power for a cheap weapon. Rakano aggro may also want this, since it lets you a-space and play weapons after the opponent tries to block. child roland: 3 Power 3/2 with no Aegis is a rough stat-line. Ability is definitely strong though, we’ll see. lv13david: If you’re playing a weapon at fast speed, it’s probably for defensive purposes. So you’re playing a 3/2 for 3 for defensive purposes? Maybe doubling your amount of fast speed Stand Togethers is worth it in some far-off meta. I rate it 2 stylish cloaks. Paradox: 1.5? I think being a 3/2 with no aegis or evasion makes sure this doesn’t get too out of hand, but it does seem spicy and could be good if enough powerful weapons are printed. ThePlatypusKing: 1/1 Best Minotaur of Set 5 Yet. TinMan: 1 – This frozen cow reminded me to take that ground beef out of my freezer so I can cook dinner. Other than that, this card is useless, but I do appreciate the reminder. Tobboo: 2 – Justice 3 drops are just too good. This will have a hard time competing with them. Almost: 1/5 – This card is not good, but you can do some fun things with it. BruisedByGod: 0/5 for serious play since it has a terrible body, a terrible statline, and terrible abilities. child roland: No. Want to play it in Draft at least once though. OK, I want it every draft. lv13david: I love the flavor of a reckless “Flamebrewer” eating a Torch. Which is what will happen every time you cast this card. This one is for Pojo. I rate it 1.5 random spells. Paradox: Constructed: 0.0. Fun Tier list: 5.0. This guy is literally hot jank. ThePlatypusKing: 0/1 This card will win the first ETS of 2019. TinMan: 1 – We Hearthstone now boiz!!!! Tobboo: 3 – Has potential, but have to be built around, and I dont think its good enough for that.